Discussion in 'Detroit Lions' started by Meireles, Aug 30, 2015. If true I will actually have to watch the game. Yes even the local media is saying Zenner should be the option. I remain skeptical. I can see Blount getting the initial call and if he breaks off a 7 yard run he probably gets the majority of the carries. One thing is for sure we will see where Patricia's mind is at in these kind of decisions. I'm not hopeful. He got pretty shredded for this tour of duty. It would be great of these last two weeks Zenner has big games as an audition towards the offseason. Maybe some team will give him opportunity to become starter. Well, he had a similar audition the last few games of 2016 under identical circumstances (all the "real" running backs being injured) and acquitted himself very well. He was "rewarded" with 14 carries for all of 2017 and even fewer this year until the "Hillis Curse" again worked in his favor. He'll need to rush for 400 yards and a dozen touchdowns on Sunday to create a bit of interest in being used more next year. Sportswriter for mlive.com makes the same argument as us. Zach Zenner should be carrying the rock. We already know what LeGarrette Blount can do, and it isn’t much. He’s averaging 2.8 yards per carry this season, almost a full yard less than he’s averaged in any other season of his career. At 32 years old, it just seems like his best days are behind him. It certainly seems like he won’t be back next year. So what’s the point in trotting him out there in the starting lineup? What’s the point of giving him as many carries as the rest of your tailbacks combined? What’s the point in targeting him four times in the passing game, when he somehow turns them into minus-5 yards? Especially when Zenner continues to outplay him? Zenner rushed for 16 more yards, even though he came off the bench and got three fewer carries. He averaged 5.6 yards a pop, which more than doubled Blount (2.6). He’s averaging 5.1 yards per carry for the season, which is nearly double Blount (2.8). And it sure looks like he could have a place on next year’s team as a staple on special teams and a reserve at running back. So again, I ask: Based on their performance this year, and their potential to contribute next year, which is all that matters anymore anyway, what’s the point in trotting Blount out there as your No. 1 back? Give Zenner the rock. He’s earned it. I agree Blount should not see the field again in Detroit....Yes, it looks like Zach has done what seemed impossible back in October -- he put his career back on track, when it seemed it would be over after the pre-season injury. 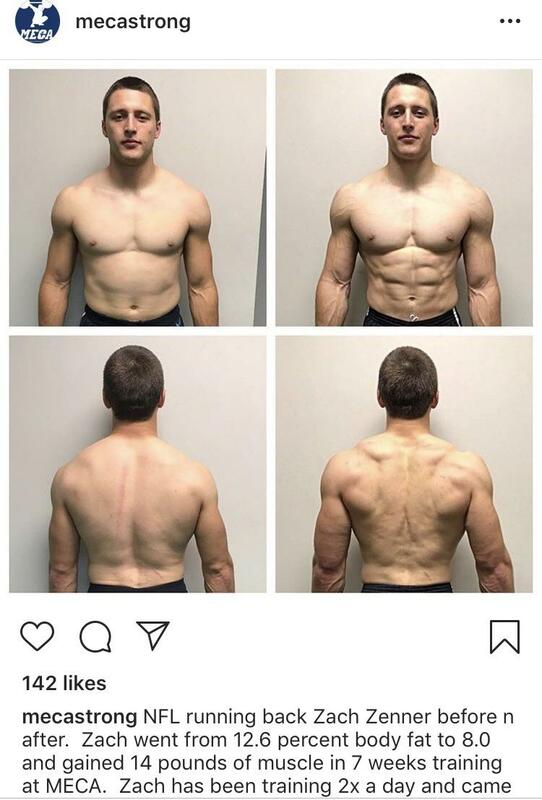 I'm sure the incredible amount of muscle he added while rehabbing helped a lot (look at backrow's pics). Want to go back and give a list of backs that were clearly ahead of ZZ on the depth-chart at some point since pre-season 2015. All are now out of football or barely hanging on with other teams. Shows how much he has overcome to even get the modest work he's received so far: Dwayne Washington, Ameer Abdullah, Tion Green, Matt Asiata, Justin Forsett, Stevan Ridley, George Winn and Joique Bell. “Abdullah would probably have gotten more yards”? RB, writer's name on this particular fan site is "Mansur Shaheen". Looking at his facebook photo he's clearly North African or from the Middle East. He also seems to love Liverpool soccer. It's possible his family are among the millions of white-male hating Muslim's allowed to flood into the U.K. the last 30 years (or more) thanks to the Rothschild's and other notable jewish banking families that actually run "Cuck Island" and are trying to destroy it behind the scenes? He now appears to be in the U.S., a Detroit Lions super-fan, residing in Virginia. Any surprise he's dumping all over the lily white tailback of Germanic decent, while praising a black, second round draft-bust with the Muslim name Ameer Abdullah? I think not. Thanks for the Mansur link rocky bleier, but I refused to read the article. As bad as the mainstream "fake news" media is in the U.S., they tend to be more fair and objective in the realm of sports. Here's a better link. Interestingly, Mike Zimmer of the Vikings gives a slightly less Caste assessment of ZZ than bearded Fatt Matt, his own head coach. Also, we learn ZZ and Adam Thielen are very good friends/workout partners. I was at the game, I just don’t understand why Zenner came out of the game at all. Are there any stats to support my assumptions? Zach Zenner isn't a secret superstar, waiting in the shadows, but there's no denying his overall effectiveness since rejoining the Lions in November. He has just 34 carries, but is averaging a crisp 5.1 yards per attempt. Meanwhile, LeGarrette Blount is churning out a paltry 2.8 yards per pop. Zenner simply does a better job of getting north and south. Why the Lions aren't leaning more on him down the stretch of this season is beyond me. Matt Patricia has been a huge disappointment. I was hoping for at least Belichick or Mangini type "daring." If Patricia keeps his job it'll be interesting to see if he's as bad as Pete Carroll and Black Jack Del Rio. Zach Zenner should be finishing up his fourth season either as the starter or at worst as part of a RBBC. Yet it won't be surprising in the least if he's out of the league next year. I'd give that better odds than him being a starter, whether in Detroit or elsewhere. That's why I write that Christian McCaffrey isn't a game changer, nor any of the other Whites that break through at "taboo" positions. Every organization plays the game the same way, a few just aren't quite as bad as the others. To be truly different would be like McDonald's or some other large corporation suddenly showing only Whites in their commercials, or just a few token non-Whites. And there's absolutely nothing to gain by doing that under the present anti-White system. Everyone who profits by the system knows what the racial politics rules are, and they apply to everything, not just the NFL. The Caste System was the pioneer; now it's a society-wide template (with of course other minorities than just blacks being heavily used depending on the situation) for The Great Replacement. Zenner was seriously cheated out of a 100 yard game. It's the kind of disrespect that is aimed at White athletes only. Blount got 11 mostly ineffective carries, including the last one at the end of the 4th quarter for 6 yards. Zenner gets that carry and maybe breaks 100. Not only that the Lions went into the victory formation after that with Stafford kneeling twice, first at 1:16. It wouldn't have been a big deal to give Zenner a couple of carries instead. There was no downside to it and the Packers wouldn't have cared. At least the local media has gotten on his band wagon although that will probably change by next season. I expect the Lions to sign a free agent "real back" and draft or pick up an UFA supa affelte to shore up the position. If Zenner can stick he should be in a good position. Kerryon Johnson is sure to get hurt again so he should be in the mix. After the game they interviewed ZZ on local radio. He was humble as expected, he's taking his MCAT to get back into medical school, he's going to be a doctor someday. He also talked about how he works at a medical research facility working on cutting edge medicine in the offseason. As good as that sounds to the average person it probably makes football people cringe as their idea of the typical offseason for an NFL player is to lay around getting high and beating up their woman. That's what a REAL player does. Here's hoping Zenner can continue to bring some class to the game. I get daily alerts on Zach Zenner, and he's actually getting some respect as a potential free agent signing. It would be nice if some team would sign him to be an integral part of their RBBC as I don't think any team will sign him to be their starter. He's obviously a three-down do-it-all-well player but at this point it would be better if he went somewhere else as the Lions have drastically underused him, including feeding the washed up Blount over and over last year -- 155 carries for a 2.7 average compared to Zach's 55 carries for a 4.8 average. And they were both behind the rookie Kerryon Johnson. Here's some 2018 highlights. Warning: hideous music, best watched with the volume off. Watching these highlights, he reminds me very much of Rex Burkhead. He does resemble Rex in his running style. The Vikings, against whom he had a nice game last year, would be a good landing spot if Latavius Murray signs with another team as he's expected to do. You'd have Dalvin Cook, whose health is always a question mark, and Zenner taking over Murray's role. I was hoping he was headed to the vikings but if they put him as the number #2 rb he might have made the right decision. Time will tell. ZZ is one of the reasons I actually watched NFL games last year, ya hear that NFL? If I were a GM/HC type in the NFL my system would be to have a white RB of the talent like ZZ and so many others at least in the 3rd place on the depth chart or a powerback bull as FB. Knowing the dynamics of the black ran locker rooms I would want to keep my backs honest. Take Adrian Peterson for example in 2009 a fumbling machine, so no doubt by accident they take a feature back with a chronic skin condition in Toby and what does AP do at least till the last NFC championship game the Vikes were in he actually holds on to the ball, coincidence I think not, I think AP got religion. Poor Toby though cheap shotted by a guy in a practice, one way to have the equality nonsense knocked out of you. Wile, Zenner is the only reason I tuned into Lions games last season, other than to root against them versus the Patriots, Vikings and Packers. Most of the season, I didn't even check the box scores for Lions stats. Once Zenner was signed and started to play I even watched their games online, via streams. (((They))) basically set up the caste system to push an anti-white agenda, so I don't think the NFL or individual teams even care that much if whites watch on TV or attend games in large numbers anymore.